Patch 2.0 was designed to simplify the user experience by differentiating clearly between news and user-generated content. 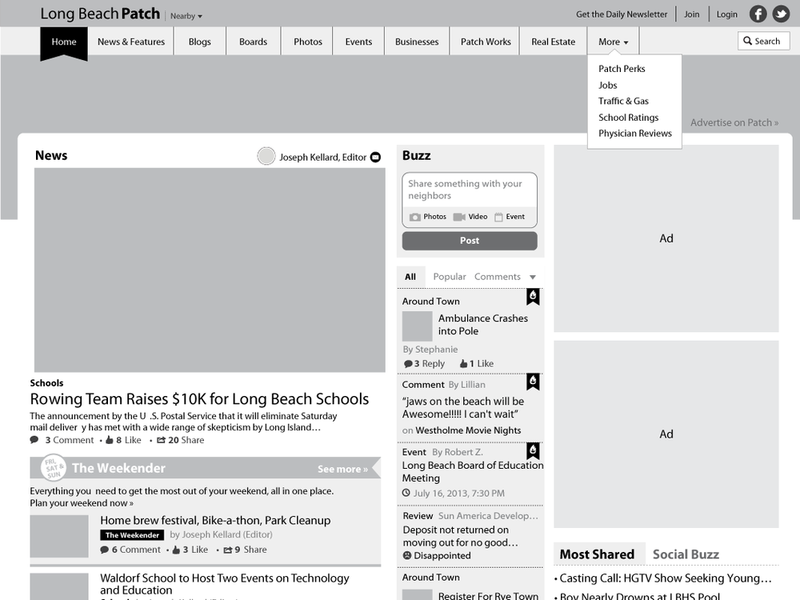 Patch Boards was created as a place where everyone in the community could post announcements, photos, buy or sell something, and start a conversation about any topic that they cared about. The concept of groups was conceived after a series of ethnographic studies in Patch towns exposed an opportunity to connect people around different shared interests like local sports, volunteering, events, town government, schools etc. Anyone could create a group which was essentially a place to share news, opinions, media, events, and comments about a particular topic that people could follow – on the web, on their mobile phone, or by email. Alpha was launched in 5 towns in Long Island, NY.